New Science 20: It’s not CO2, so what Is the main cause of Global Warming? We are back in the hunt for the main mystery drivers of our climate. 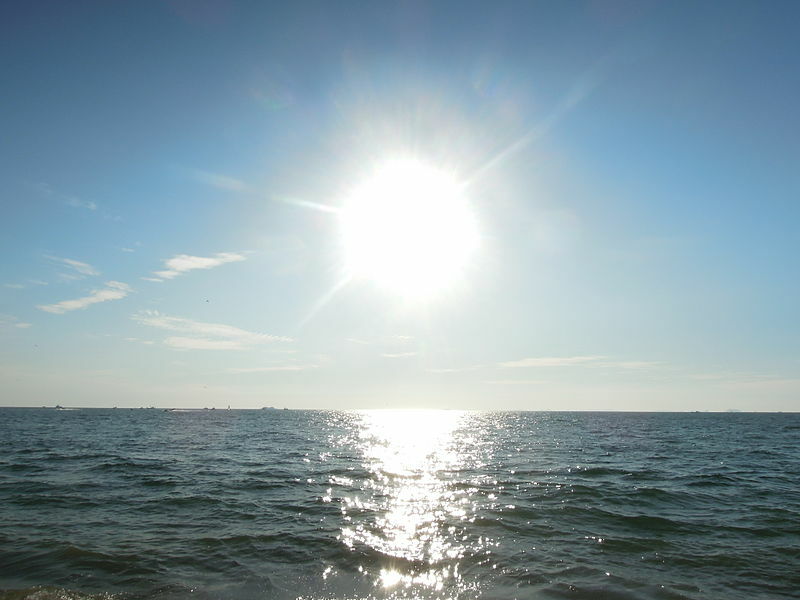 The IPCC says it can’t be the Sun because the total amount of sunlight barely changes. Which is the usual half-truth that pretends the Sun is simple a ball of fire with no magnetic field, no solar wind, and has no changes in the “color” of the spectrum it emits. But the Sun has a massive fluxing magnetic field that turns itself inside out and upside down regularly, it churns off a stream of charged particles that rain on Earth, and if human eyes could see infra red and UV, we’d see the color of the Sun change through the cycle. We are only just beginning to figure out how these aspects affect the climate. But we know these factors influence ozone, probably cloud seeding, and possibly jet streams. The only good long data we have on the Sun are the sunspots, which give us a reasonable idea of total sunlight since 1610. David uses Fourier maths to find the way that total solar irradiance (TSI) might relate to temperatures on Earth. TSI itself barely changes, so it could only have caused about 10% of the variation of Earth’s temperature since 1900 (if the official temperature records are to be believed). But it’s the main clue we’ve got to figure out how other parts of the solar dynamo may be changing the weather here on Earth. The most likely mechanism is through cloud cover, which covers 60% of the Earth and reflects 30% of the incoming energy. And small change will make a big difference. David‘s model looks for externally driven changes to albedo, which means forces other than surface warming that influence our clouds. The IPCC assumes this doesn’t happen. What can I say? Their models don’t work. The notch delay solar model is a physical model, based on physical principles, not curve fitting. It uses standard analytical tools employed throughout the electronics industry. Few climate scientists were trained in them — they have probably never heard of most of them. But engineers have to get the maths and the feedbacks right, or the phone and the electricity don’t work… these tools have been tested. When the signals from the Sun are pulled apart this way, the patterns show a classic notch filter. 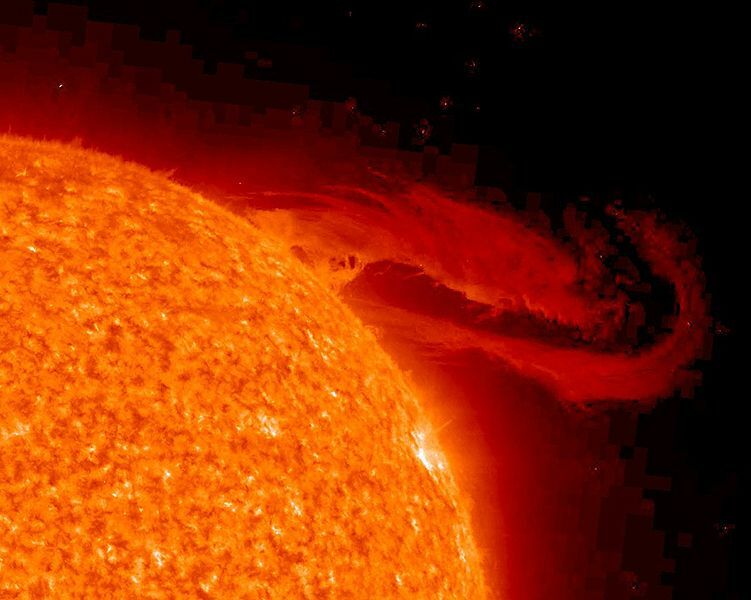 At the frequency of a half solar cycle (about 11 years), some mechanism operates which temporarily reduces the effect of incoming solar radiation. Because it is so in tune with solar cycles it must originate on the Sun itself. Further, here seems to be a delay between changes in TSI and its effect on Earth’s temperature, also of about 11 years. The maths of notch filters shows this delay might be part of the notching mechanism, or might be separate. Obviously sunlight itself is not having a delayed effect on Earth 11 years later, instead a change in total sunlight is a leading indicator of some other solar factor that changes a half cycle after TSI changes. The delay is synched to the Sun. The exact mechanism is still to be figured out (there are several candidates). David updates the progress on this from last year. While we said then that a notch filter dictated that there had to be a delay, Bernie Hutchins pointed out that it didn’t guarantee it. But by then we’d found other independent empirical evidence — published in a few papers over the last 20 years, that indicate a delay must be occurring. 20. So What Is the Main Cause of Global Warming? Dr David Evans, 22 November 2015, Project home, Intro, Previous, Next. So if carbon dioxide is not the cause of 80% of global warming, what is? Let’s start by ruling out what it is not. The dog-obvious suspect is the Sun. But the IPCC is adamant that it’s is not that important. You have to read the fine print – they only consider the direct heating effect of the total solar irradiation (TSI), not all the other potential solar factors. As far as giant light bulbs go, the Sun shines a remarkably steady light. The TSI is so steady that it was called “the solar constant” until satellites began to measure it in late 1978, from which time it has varied by less than 0.1%. Before 1978, we can estimate the TSI from the number of sunspots, which remarkably have been recorded right back to 1610. As best as we can tell, in the last 400 years the TSI has varied by less than 0.2%. The variation in direct heating by TSI is simply too small to explain global warming. It is easily calculated (next post) that fluctuations in TSI caused less than 10% of the 0.8 °C of global warming observed since 1900. In our search for the cause of global warming, we look for a non-anthropogenic cause. Why? There was considerable temperature variation during the current inter-glacial before industrialization: globally, the depth of the Little Ice Age around 1640 AD was ~1.5 °C cooler than today, while the Medieval Warm Period around 1000 AD was about as warm as the modern period (Christiansen & Ljungqvist, 2012, ). The last century, which has seen ~94% of human emissions of CO2 in all of history, has warmed only ~0.8 °C. We seek a non-anthropogenic source of albedo modulation. Why? Albedo is the fraction of TSI incident on the Earth that is reflected back out to space, mainly by clouds and ice. Reflected radiation head back out to space without warming the planet. Albedo is about 30%. Small changes in albedo make significant changes in the amount of absorbed solar radiation (ASR), enough to account for global warming (a 2% change in albedo increases solar forcing by 2 W/m2, the same forcing as due to the change in CO2 to date since pre-industrial, not that all forcings have the even roughly the same effect on surface temperature). There are many processes that affect clouds and ice, including some potentially affected indirectly by the Sun. Variation in albedo, often called “albedo modulation”, is the most obvious non-anthropogenic mechanism for global warming. Yet the conventional models omit any changes in albedo from any source other than feedbacks in response to surface warming. We call this omitted albedo “externally-driven albedo” (EDA). EDA includes albedo due to something external, such as the Sun, as well as due to any feedbacks other than to surface warming. (And to state the obvious: the total change in albedo is the change in EDA plus the change in albedo in response to surface warming). EDA appears to quite significant, and possibly crucial, as shown in post 10. When we compared the fractional variation in albedo to the fractional variation in TSI, and accounted for albedo feedbacks to surface warming, the effect of changes in EDA on surface warming was shown to be at least twice as great as the direct heating effect of changes in TSI — and possibly many times greater. This is prima facie evidence that EDA is strong enough to be the leading suspect as the cause of global warming. We search for a natural source of albedo modulation related to the Sun. The Sun is the most obvious source of EDA, or is at least likely be somehow involved if the cause is something in our solar system, such as the Jovian planets. We explore the link between TSI and surface temperature on Earth. The only thing about the Sun that we’ve measured for long enough to matter is the number of sunspots, which have been recorded since 1610. All the other solar parameters are either inferred from proxies, or were only measured after 1947 — which leaves only three full solar cycles (or Hale cycles, each ~22 years). Notably, this modern period was also a period of an unusually high level of sunspot activity. The relationship between sunspots and TSI since 1978 has been studied and used to estimate TSI back to 1610; although we use TSI in this search, bear in mind that nearly all of the TSI record is deduced from the sunspot record. People argue about that exact relationship between sunspots and TSI, and there are competing reconstructions of TSI with significantly different backgrounds (the long slow cycles, or low frequency components). Please note, as the evidence and hypotheses are presented in this series, that the precise reconstruction makes no difference — because the notch-delay hypothesis is mainly about shorter term cycles, nearer the higher 11-year frequency. Only in the predictions post does the background reconstruction make a difference, and there we have made predictions for each of the two main reconstructions. Fourier analysis is useful for analyzing the way TSI relates to the surface temperature, because there is a linear invariant system. Carefully analysis using a newly-developed low-noise Fourier technique revealed an apparently new feature: a notch in the transfer function of the system, centered on the frequency corresponding to 11 years. The peaks in TSI every ~11 years as part of the sunspot cycle are not reflected in the surface temperature record. The notch suggests the possibility of, but does not mandate, a delay of several years between a change in TSI and the corresponding change in surface temperature. Evidence for a delay of ~11 years is found in several disparate sources. This leads to the force-X hypothesis, that a warming influence called “force X” affects the Earth’s albedo, and that force X is a smoothed version of the TSI delayed by one sunspot cycle. Thus tremors in TSI foretell what force X will be ~11 years later. Force X is at a minimum when the Sun’s magnetic field flips polarity, which causes notching — the flips coincide with the peaks in TSI. The notch-delay hypothesis is a physical model that describes a solar influence on the Earth’s surface temperatures by its vital properties. It’s a model based on physical principles, as opposed to a mere mathematical curve fit. It is not fully fleshed-out because the mechanics of force X are unknown, but, like x-rays when they were first discovered, enough critical properties are known or hypothesized to be useful. Fitting the TSI and temperature records to the resulting notch-delay solar model, we find that force X has between 10 and 20 times as much influence on surface temperatures as the direct heating effect of changes in TSI. This is enough to account for global warming, and is compatible with the earlier finding that CO2 caused less than 20% of the recent global warming. There was a significant fall in TSI around 2004, suggesting a fall in force X and significant surface cooling from ~2017 (the current sunspot cycle is 13 years, 2004 + 13 = 2017). This prediction leads to a falsifiability condition on the notch-delay hypothesis. Systems, Sinusoids, the Fourier Transform, and Filters. Frequency-domain knowledge behind this series, explained from scratch, including linear invariant systems, sinusoids, the Fourier transform, simple low pass, delay and notch filters, transfer functions, and step responses. PDF. The Optimal Fourier Transform (OFT). The OFT is a low-noise version of the Fourier transform for time series, pioneered for this paper, which is superior to the standard Discrete Fourier Transform (DFT) and Fast Fourier Transform (FFT) for finding signals in short, noisy datasets. PDF. climate.xlsm. Spreadsheet containing all the data and code. When last we posted on the notch-delay solar theory (the project home page), we thought that there had been a mistake over the causality of notch filters. This has now been resolved. Some notch filters are causal (Bernie Hutchins was correct), but there are also non-causal notch filters (our methods and calculations were correct, but incomplete). A non-causal filter mandates a delay to make it causal, so when we mistakenly thought all notch filters were non-causal we used this as evidence of a delay. Now we simply rely on empirical evidence for establishing that there is a delay. In retrospect, this mistake was a bit of a lucky accident. Thinking that there must be a delay caused us to look for supporting evidence, which turned up quite a bit. Bottom line: A notch does not imply that there must be a delay, but the existence of non-causal notch filters requiring a delay suggest the possibility of a delay. In any case, several disparate observations by others point to a delay, so it seems there really is a delay. Some technical details: The transfer function for a notch filter is the ratio of two quadratics in a complex frequency variable, each quadratic containing the square root of −1, which could be either +i or –i, where i is the imaginary number. The numerator and denominator of the transfer function could each separately use ±i, for a total of four possibilities. Two of those possibilities lead to a causal notch filter, two to a non-causal notch filter. As it happens I had used + in both cases, which led to a non-causal filter, and, not noticing the other three possibilities, I thought that a notch filter was necessarily non-causal — which would require the notch filter to be accompanied by a delay to make it causal and thus possible, necessitating a delay of at least several years between a change in TSI and the corresponding change in surface temperature on Earth. Now, with the complete picture of causal and non-causal notch filters, the mathematics does not require a delay. So the evidence for the delay now rests solely on several independent observations of the delay. The suspected wrap around problem with the FFT turned out to be insignificant — while imperfect, the approximation was extremely good. See the systems document for the gory details, or play with it in the spreadsheet. * The Royal Society now talks about carbon dioxide only as causing the warming of the last 50 years, so we take the “recent decades” to mean since about 1970, so it includes the relatively fast warming of the 1970s – 90s. It probably is also applicable back to 1910, the turning point of Mann’s hockey stick, to include the 1910 to 1940 warming (though I imagine there really would have been a hotspot in the 1920s). [1^] Christiansen, B., & Ljungqvist, F. C. (2012). The extra-tropical Northern Hemisphere temperature in the last two millennia: reconstructions of low-frequency variability. Climate of the Past, doi:10.5194/cp-8-765-2012. 192 comments to New Science 20: It’s not CO2, so what Is the main cause of Global Warming? A truly excellent contribution to the ongoing discussion on what really causes climate change, David and Jo. Albedo effects were widely written about in such journals as “Scientific American” back in the 1960′s before they started publishing bull droppings. So, it’s good brain therapy to read about your work and long may you continue. I had been trying to work out why CAGW adherts to “the faith” were on such hair triggers when it comes to criticism. I found this rather good article on how universities seem to be mentally training students to be inheretnly intolerant to everything…..I wonder who most of these whiny people would cope with a solid old game of rugger in a noisy pub afterward? “As Burns defines it, mental filtering is “pick[ing] out a negative detail in any situation and dwell[ing] on it exclusively, thus perceiving that the whole situation is negative.” Leahy, Holland, and McGinn refer to this as “negative filtering,” which they define as “focus[ing] almost exclusively on the negatives and seldom notic[ing] the positives.” When applied to campus life, mental filtering allows for simpleminded demonization. If campus culture conveys the idea that visitors must be pure, with résumés that never offend generally left-leaning campus sensibilities, then higher education will have taken a further step toward intellectual homogeneity and the creation of an environment in which students rarely encounter diverse viewpoints. And universities will have reinforced the belief that it’s okay to filter out the positive. If students graduate believing that they can learn nothing from people they dislike or from those with whom they disagree, we will have done them a great intellectual disservice. After the student reported Jung’s comment, a group of nearly 20 others e-mailed the UCF administration explaining that the comment had clearly been made in jest. Nevertheless, UCF suspended Jung from all university duties and demanded that he obtain written certification from a mental-health professional that he was “not a threat to [himself] or to the university community” before he would be allowed to return to campus. All of these actions teach a common lesson: smart people do, in fact, overreact to innocuous speech, make mountains out of molehills, and seek punishment for anyone whose words make anyone else feel uncomfortable. This reeks of a rudimentary form of mind control/programming/brainwashing…. I think it is interesting how many technically-trained individuals that have been long-time readers of SA share your opinion about the decline in its quality. Thanks David and Jo for all the work you guys have done and are still doing. Though I don’t understand the technical details and mathematics, the summaries are well written and understandable. I hate the thought of any cooling, that is where the real issues ought to be better better dealt with, or society will suffer immensely after the energy disasters the Green Blob have invoked on us. Global warming, as the agenda that was shoved at us, is just the vessel for stealing large sums of money from the gullible leaders of the West for their ‘One World’ Green dream. A $tip coming your way. Cold sweeps across the Northern Hemisphere. Pray that this continues into mid December, especially in Paris. I reckon the “refugees” might do a U-turn once it starts to bite hard. Maximums are forecast to be only single digits this week. As is usual with Parisian weather, I will believe it when I see it. I could not agree more with Ivar Giaever, Nobel Prize winner in Physics. Firstly the average temperature of a whole planet over a whole year is a silly and meaningless thing. Then how lucky that we were born into a perfect world with a perfect temperature. Lastly, it has been remarkably stable varying from 1880 to 2015 from 288 to 288.8K. So what global warming? Such small ‘warming’ as we have seen is almost semantic and arguable as stable. The temperature has not changed at all in the last twenty years. There is no detectable change in the rate of sea level increase either as the huge oceans slowly warm up from the little ice age. So theories about what is causing any change in temperature are interesting, but we must not lose sight of the original huge scare, that we were supposedly seeing unprecedented, rapid, large and disastrous Global Warming which had reached a tipping point where it was going to be a runaway disaster and soon cities under 100 metres of water and millions dead? Poor Kiribati. “The greatest moral challenge of our generation”. Officially, according to the IPCC, over 400 million Indians dead from thirst within 35 years. This from a throw away comment on a single glacier from a tour guide. Peer reviewed. Good luck with the theories about what is producing warming, as there is none apparent. Or cooling. Nothing is changing. Some major event would be needed to change this situation, on a global scale. The impact of puny humans on the planet’s temperature is zero and that is the subject. That is not to say we cannot change climates by dams, irrigation, rerouting water, burning forests, changing vegetation but we cannot do it with fossil fuels. That was such a long and shaky and unlikely piece of logic it is amazing anyone ever believed it. As Ivar say, a religion. As for Climate Changes, Ivar’s other point is that you never hear anything good about Climate Changes. Now that’s extraordinary. Do not fear! Your banker appointed 138 Heads of State right now converging on Paris to discuss this crisis, will eventually meet 1,000,000 finely honed pitchforks, with the expected result! What to do with the Bankers? And to think that all of AGW is based on a simple modelling error — what a ghastly error. I’ve spelled out the error in so many words prominently on the project home page now. I am trying to highlight to the novice what I think is the pivotal point….the error and how it may have come about. I’m no wordsmith and the suggestion is made as an illustration with the best of intentions. You are doing marvelous work. Rob, I’d like to add more, like you suggest, but every word added to those short descriptions means more potential readers just skip over it and don’t read anything. So the text gets cut to the barest essentials, without sounding stilted. I expand on it in the Summary (13 pages), Synopsis (22 pages), and the blog posts, but the text on the home page is only just enough to get across a main idea and spark interest. As for Twitter, I’ve no hope, the ideas are too complex. New Climate model says man not to blame! Agree gai. Twitter messages are just the “bait on the hook”. I’m not on Twitter but hopefully those that are, will bait a few hooks for David & Jo. Those are decent David however remember most of these people have the understanding of a ten year old. That is why I went with very simple. BTW twitter is based on the three-second rule that says your advertising must grab viewers’ attention in the first three seconds, or you will lose them. I’ve put up some example tweets at http://sciencespeak.com/climate-basic.html. Suggestions welcome. The use of proxies, in this case sunspot observations to fabricate a TSI “record”, is always fraught with hazards of assumptions. Sunspots may not be a terrible proxy for TSI, but for something that varies so little (TSI) against something that varies a lot (sunspot count), I find little value in the exercise. However, the TSI’s composition; the spectral content; does appear to vary more substantially with sunspots. The spectral content determines where and how the solar radiation is absorbed or reflected. — Joni Mitchell (the last, honest climate scientist). Bernd, I’d hazard a guess that the spectral composition of the Sun’s radiation are going to prove to be critical. Yes, sunspots are probably only interesting for global warming because they are clues to something else. Changes in UV penetration into atmosphere, water, soil etc due to changes in the UV spectrum. ? I think I mentioned this a couple of years ago. I even had a nice paper somewhere that showed big realative changes in absorption in sea water between 320nm and 350nm. Can’t find it now, oh well. See Optical Absorption of Water Compendium for a list of papers. Do you have anything on the measure reflectivity at angles far from normal? Thanks! For water and ice, the reflection can be predicted well with Fresnel’s equation. It only gets dicey when there are a lot of whitecaps on the water. The hemispherical bi-directional reflectance distribution function(BRDF)for snow is well characterized. It is close to being Lambertian, but has a strong forward scattering because the snowflakes tend to lie flat. Vegetation, bare soils, and rocks are less well characterized. Although, smooth flat rocks can be approximated with Fresnel’s equation if you know the average index of refraction. All imaging satellites that have orbits that precess can be used to construct empirical BRDFs for specific terrestrial materials. There is at least one satellite designed to take multiple views at different angles simultaneously, thus giving the reflectivity at different angles, from which a BRDF may be inferred (I hate to use the word “modeled” since it has such a bad reputation on this blog). Something that is not appreciated by those who attribute Arctic warming to “dark water” created by melting ice, is that at glancing angles (e.g. at the equinox) the reflectivity of water is one (1), unity. That is, it is higher than for snow. At an angle of incidence greater than about 60 deg the reflectivity climbs rapidly from about 30% to 100%. It is only at the tropics that water has a reflectivity of about 4%. I also suspect that Sol’s magnetic cycle plays a role somehow. I share that suspicion. It was a long time ago, that I had anything to do with long range communications, but I do remember that the Earth’s Ionisphere goes up and down over an eleven year cycle. We were bouncing HF frequencies of the ionosphere to transmit digitally encrypted Murry code signals over long distances. The actual frequencies we used were dependent on the distance between stations, and the expected height of the ionosphere, which is reflective at those frequencies. So, little red thumb.. nothing coherent to add ?? So hilarious that you are too cowardly to do anything but press a red thumb. That implies considerable uncertainty about the TSI value. Hence I doubt that anyone can be sure if the TSI has changed over the past 150 years, nor by how much. The latest measurement of the TSI is 1361W/sqm but it does seem to vary by more than 1W/sqm and the record is only 3 months long. I don’t dispute the finding that the Sun’s activity varies little over the 11-year sunspot cycle. But what about the longer cycles, 100 to 200 years? I am not certain about this, but there is some evidence of longer-term variations that could affect climate (Gleissberg and Suess / DeVries cycles). This concept is back to front. The Earth is not warming from a previous stable state, but is recovering from a previous cooling event, the LIA. Research should be directed to working out the cause of the ice ages and not the mechanism of warming. Notice that ice ages are also associated with anomalous CO2 values for the atmosphere. The human population explosion is thus an effect from the return to a warmer climate state until the next “ice-age” occurs, when the biosphere will experience another climate catastrophe. Yeehaw.. someone gets it !!! And everyone will get it when the imminent LIA kicks in, that is except diehard “Warmists” who will be in therapy dealing with “loss of face syndrome”. Assuming they actually remember the past – this lot do seem to suffer from various manifestations of amnesia. This time it was all on the Internet, and we have the wayback machine. Communism is only the way of the future, for those who have not experienced it first hand. My hungarian-born uncle can tell people some stories about how well Communism ( doesnt ) work and how awful it is….and why he lives in Australia now. Hi David, Your work is very interesting, it is indeed the sun that controls the Earth,but it is a different energy from TSI, the solar dynamo is charged by the universe, that charge is sent out to Earth, it enters at the poles and mainly exits 30 degrees north and south of the equator. This keeps after 4.5 billion years the middle of our little planet molten. The Earth is heated from the inside out and the variations of the sun permit how much heat escapes, thus you have your notch. The charge recycles back to the sun.It is the 80% of the universe that is missing, call it an Aether if you will but it is not dark matter or dark energy, it is the energy that makes the entire universe work. It creates everything. Interesting hypothesis, especially since the sun’s nominal magnetic polar inversion is 22 years, much shorter than earth’s mag polar inversion. The challenge is to find supporting evidence to buttress that idea. Unfortunately I find relying on the Wayback Machine doesn’t work too well. Critical documents have a habit of getting completely scrubbed. I suspect that the emailgate ‘hide the decline’ means exactly that, the meteorological bodies are doing their best to stop the temperature from going down and homogenizing furiously. It is bad enough that satellites reveal the temperature has not go up, but imagine if it went down, even a little? From the man in the street to the Pope, people would ask what was going on? They were promised Global Warming? So we are all being prepared for the next big scare. Climate Change, which is always bad apparently. Of course the reason is CO2 which and while it cannot change the temperature, it is obviously the problem. Got to be. Yep. CO2. Smokestacks. Pollution. Evil industry, miners, manufacturers and farmers. Get rid of the lot. Everyone can be a public servant and we can buy everything from China, even food. It is just upsetting to see the windmills being built in their thousands in the North Sea, where no one has any shortage of power and not being built in third world countries where the need is desperate, where they have no fossil fuels and cannot afford it. East Timor for example is our neighbour and Christian (will that be moderated?) and desperately poor. They do not have roads. Imagine what we could do to help. Now give $400Million to the UN for Climate Change. What about a windmill or two? East Timor is a special case. Australia owes a debt to East Timor. The economic boundaries are drawn in Australia’s favour. The royalties from the greater sunrise oil and gas field should belong solely to Timor. Sorry for the drift, but Timor’s case is politically created. Back to the thread, has anyone started a study on recorded cloud cover derived from aviation weather forecasts? Our pilot friends have been blessed with fairly accurate wx reports for decades longer than satellite coverage. The situation in International Law is quite clear, the boundary is the tectonic one. Australia has given East Timor a share of what it could claim 100%. This is in line with the agreement with Indonesia. The winge-Ing by East Timor is merely a try to get more, e.g. a refinery which could only be supplied by a pipeline across a geologically active fault line. They don’t understand – or don’t want to – the technical problems and rely ion wishful thinking. Much like the believers in renewable energy and politicians in many western countries. Yes, there is a huge trench between Timor and Australia. They are off the continental shelf and part of Indonesia. There is no legal reason to share the oil revenues, apart from being too desperately poor to do anything and pumping to Timor is impossible because of the trench. While the Greens agonize about every coral atoll, we have neighbours who desperately need our help but nothing to do with Climate Change. The building of windmills is a big industry around the world including Australia. Why not just redirect it to where they would make a huge difference? Dreamy pacific atolls have no water. Windmills can power desalination, a very practical energy storage. >>but is recovering from a previous cooling event, the LIA. But it is also cooling from the Holocene Warming period, and preparing for the next Ice Age. ** So there is a complex interplay of many long-term cycles that are all having their say on our present climate-trajectory. ** If Ice Ace forcing is governed by the 21.7 ky precessional Great Year cycle, then the next Ice Age will be ‘mild’. The precessional Great Winter normally plunges by about 90 wm2 in the NH during the Great Winter (see graph in my post below). But the Milankovitch prediction for our present cycle is that the NH insolation never goes any lower than it is now. In fact, the outlook for the Ice Age “weather-climate” is relatively steady and mild for the next 150,000 years. 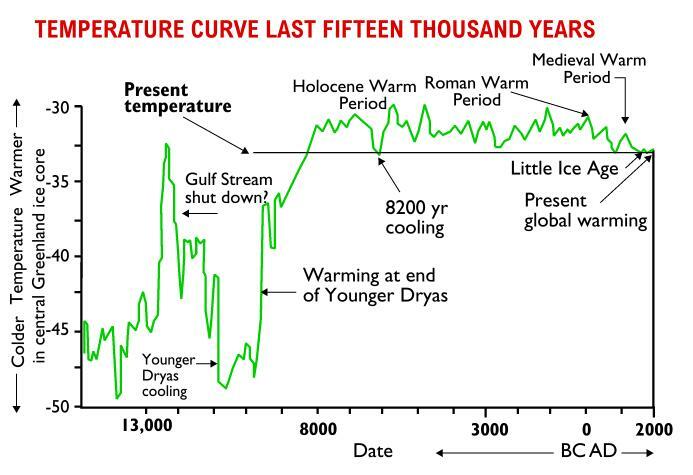 So civilisation has emerged at a very convenient calm period in our long-term climate-weather. Yes, of course it is.. The “modern slightly warm period” (MSWP) is just a small bump on the longer term cooling referred to as the Neoglaciation. Long may that small bump last !! Ralph not every one agrees. Hope that the Holocene would go long was given a major hit by Lisiecki and Raymo in 2005 in their rebuttal of Loutre and Berger, 2003. No more recent papers has rebutted Lisiecki and Raymo in the decade since then. Not that the MSM would bother telling us that. The older Berger paper (based on models) is what NOAA references even now. No mention of the newer Lisiecki and Raymo paper based on evidence. You would think NOAA doesn’t want the Sheeple to know. Recent research has focused on MIS 11 as a possible analog for the present interglacial [e.g., Loutre and Berger, 2003; EPICA Community Members, 2004] because both occur during times of low eccentricity. The LR04 age model establishes that MIS 11 spans two precession cycles, with d18O values below 3.6% for 20 kyr, from 398 – 418 ka. In comparison, stages 9 and 5 remained below 3.6% for 13 and 12 kyr, respectively, and the Holocene interglacial has lasted 11 kyr so far. In the LR04 age model, the average LSR of 29 sites is the same from 398– 418 ka as from 250–650 ka; consequently, stage 11 is unlikely to be artificially stretched. However, the 21 June insolation minimum at 65°N during MIS 11 is only 489 W/m2, much less pronounced than the present minimum of 474 W/m2. In addition, current insolation values are not predicted to return to the high values of late MIS 11 for another 65 kyr. We propose that this effectively precludes a ‘‘double precession cycle’’ interglacial [e.g., Raymo, 1997] in the Holocene without human influence. …although it has been unclear whether the subdued current summer insolation minimum (479 W m−2 ), the lowest of the last 800 kyr, would be sufficient to lead to glaciation (e.g. Crucifix, 2011). Comparison with MIS 19c, a close astronomical analogue characterized by an equally weak summer insolation minimum (474 W m−2 ) and a smaller overall decrease from maximum summer solstice insolation values, suggests that glacial inception is possible despite the subdued insolation forcing, if CO2 concentrations were 240 ± 5 ppmv (Tzedakis et al., 2012). …..
….Because the intensities of the 397 ka BP and present insolation minima are very similar, we conclude that under natural boundary conditions the present insolation minimum holds the potential to terminate the Holocene interglacial. Our findings support the Ruddiman hypothesis [Ruddiman, W., 2003. The Anthropogenic Greenhouse Era began thousands of years ago. Climate Change 61, 261–293], which proposes that early anthropogenic greenhouse gas emission prevented the inception of a glacial that would otherwise already have started…. Given the age of the Holocene and the low level of solar insolation resulting, the witch hunt against CO2 is really rather humorous…. If you like black humor. It is credible that the Earth is warming as a recovery from an ice age. It would be more credible if this assertion had a mechanism. Where is the slow warming coming from? Was it stored in oceans that are now circulating the heat to the surface? Or is it coming from the sun by methods such as changes in the solar emission spectrum? Or something else? …IPCC scientists have conducted relatively few studies of the Sun’s influence on modern warming, assuming that the temperature influence of this rare and unique Grand maximum of solar activity, which has occurred only once in the past 3,000 years, is far inferior to the radiative power provided by the rising CO2 concentration of the Earth’s atmosphere. So we are exiting a Grand solar maximum which has occurred only ONCE in the last 3,000 years. An ice core removed from the Upper Fremont Glacier in Wyoming provides evidence for abrupt climate change during the mid-1800s…. At a depth of 152 m the refined age-depth profile shows good agreement (1736±10 A.D.) with the 14C age date (1729±95 A.D.). The δ18O profile of the Upper Fremont Glacier (UFG) ice core indicates a change in climate known as the Little Ice Age (LIA)…. At this depth, the age-depth profile predicts an age of 1845 A.D. Results indicate the termination of the LIA was abrupt with a major climatic shift to warmer temperatures around 1845 A.D. and continuing to present day. Prediction limits (error bars) calculated for the profile ages are ±10 years (90% confidence level). Thus a conservative estimate for the time taken to complete the LIA climatic shift to present-day climate is about 10 years, suggesting the LIA termination in alpine regions of central North America may have occurred on a relatively short (decadal) timescale. So the switch from the Little Ice Age to Modern Warm Period happened in a decade at least in that area. Dr. Evans Solar Notch-Delay Theory predicts a delay of about 11 years from a change in solar conditions to a change in earth climate. So what happened a decade before around 1840? — Solar Cycle 8. It began in November 1833 with a smoothed sunspot number of 7.3 and ended in July 1843. Max sunspot number ~210. The prior Solar Cycle 7,began in May 1823 with a smoothed sunspot number of 0.1 and ended in November 1833. Max sunspot number ~105. And thus began the Grand Solar Maximum, highest in 3,000 years which has just ended. Apologies for the slow reply but I’m still moving into the new house and Tuesday was a mission to Ikea Canberra! The mechanism for the warming post the LIA involves the oceans and implications from Gerry Pollack’s research into water. Water has unusual physical properties, especially specific heat, where both the ice and vapour phases has a specific heat of about 1 while the liquid phase of H2O has a specific heat of about 2, double the amount required for both ice and water vapour. So it takes twice as much heat energy to raise the temperature of water one degree Celsius than it does for both ice and water vapour. Pollack has discovered that water as a liquid at physical interfaces, here atmosphere/ocean, emits protons exposed to incident infrared radiation, or heat. These emitted protons move out of the liquid water into both the atmosphere and below surface of the oceans as documented by the plot of pH versus depth in the earth’s oceans. In other words stored energy in the form of “electricity” where the retained heat of the oceans exists as electrical energy, much like a storage battery. This battery effect of the oceans seems to occur at a diurnal as well as a decadal cycle, and is certainly not well understood physically, let alone incorporated into any theory of the physics of the atmosphere and oceans. Difficulties in comprehension occur when temperature is thought of as “heat” when it should be thought of as a ranking of energy state, and that variations of hear are actually changes in the system energy store. An extra complication lies in the fact that temperature is an intensive variable and such a variable, if expressed numerically, while capable of being manipulated mathematically, cannot actually produce any physically meaningful statistics, much in the same way that gold assays cannot be used in isolation to determine the overall gold content of a mineral ore-body. Gold assays, when expressed as Au%, are also intensive variables and while capable of being numerically manipulated, produce physically meaningless statistics. The principles of mineral ore-reserve estimation appply directly to the methodology used to compute global temperature aggregates. This is why I maintain the position that the present day methodologies of estimating the Earth’s global temperature are meaningless. Temperature readings need to be applied to a physically extensive quantity, surface area assigned to each temperature reading, area of influence in other words, to estimate any statistically meaningful results. Ice ages – science does not really understand how these phenomena occur but my understanding is that icea ages occur when there is an excess of protons in the earth system. For example given a volume of water and bombard it with protons suggests to me that it changes phases into ice absorbing energy from its environment at the same time. So ice occurs at hthe polar regions and high elevations because of excess protons in the system, and not because temperature drops. Remember that the transition from water to ice requires an increase in order that requires energy, solids being a higher order of state than a liquid or gas. So water in the presence of excess free protons changes phase to ice. I am not sure whether Gerry Pollack is specifically experimenting this aspect of the behaviour of water, but I have mentioned the idea that polar regions become ice-bound due to the continuous influx of solar protons which increases if the geomagnetic field, for whatever reason, decreases in strength. Ice is thus “stored” energy, and the transition from ice to water releases energy to the system thereby increasing its temperature. So when the gfeomagnetic field increases, reducing the number of solar and cosmic particles entering the system, so too does temperature rise as the new condition of a stronger geomagnetic field reduces the number of free protons, and hence the conditions favourable for ice being the stable phases of water. No one understands why the specific heat of water is double that of ice or water vapour. As I often assert, we have it back to front. Hope this brief explanation adds clarity. My uneducated guess has Sol as the main driver and when its quiet the Subtropical Ridge (STR) weakens, allowing for more vigorous Cold Air Outbreaks (CAO) to adversely impact Europe. The mechanism seems to be negative Arctic and North Atlantic Oscillations (AO/NAO) which are influenced by the 11 year cycle. If it’s not CO2, what is the main cause of Global Warming? In some ways, the challenge of 97% Settled Con-sensus Climate Science has been a conclusion, with data to follow, and who dare prove conclusion wrong is a “denier” already. 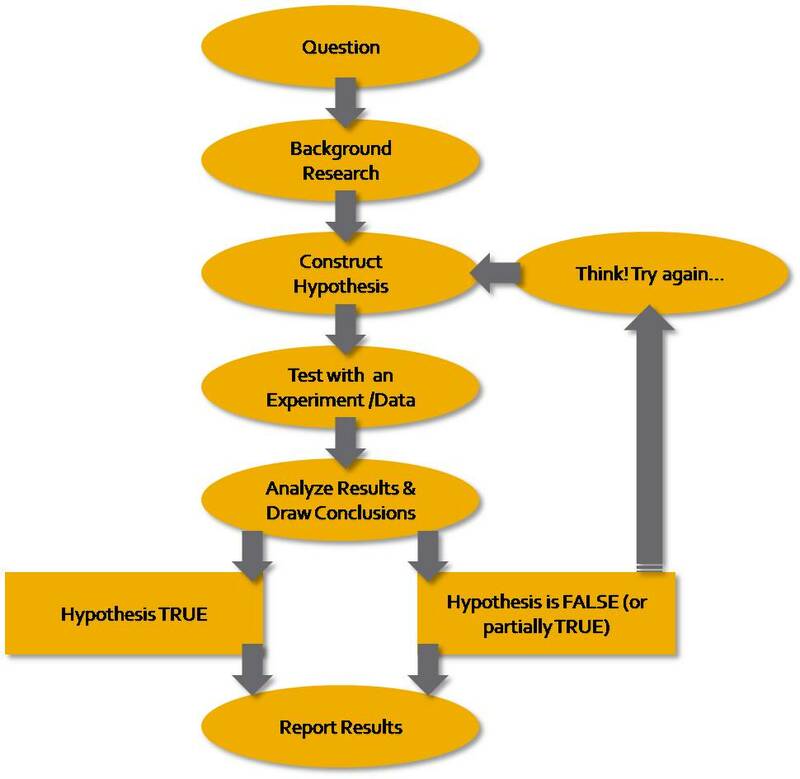 Turning the scientific method back-to-front at the very least. Well, in my humble opinion, David Evans and Jonova have accepted that challenge, done the hard yards of the scientific method that the 97% climate science couldn’t do & should have done, and, have presented a credible de-construction questioning the 97% consensus science. > As this description of our planet is nothing like today, it shows absolutely no evidence that carbon dioxide is responsible. 2. Ancestors of modern corals thrived during a time when temperatures and levels of carbon dioxide were higher than they are today, a researcher says. “An ancient coral reef specimen now on display at the Natural History Museum in London is at the centre of a global warming mystery spanning 160 million years. The exhibit is proof that ancestors of modern corals somehow thrived during the Late Jurassic period when temperatures were warmer and atmospheric levels of carbon dioxide higher than they are today. Early corals also managed to survive the mass extinction at the end of the Cretaceous period 65 million years ago that wiped out the dinosaurs and many other species. > Should I panic @400ppm CO2? No. I am convinced that the cause of the Doomsday Global Warming is #3. Increase in temperature, everything else being equal, means an increase in the energy state of the earth-system. But the way temperatures are aggregated to produce various statistics etc, is incorrect. Temperature is an intensive variable and needs to be used to “weight” or “factor” an extensive variable to produce a countable physical quantity of energy. I don’t any climate scientist understands the importance of understanding the difference between extensive and intensive variables. Aggregating temperature in isolation is no different to aggregating telephone numbers to produce a statistic and it would be essentially random. To aggregate temperature correctly you need to apply the measured temperature to a fixed volume of air etc. If it’s spatially controlled then the correct method is to apply an area of influence to the data, which is them used to factor temperature with a physical object or extensive variable. Until that is done, I maintain we actually don’t know whether the earth-system is increasing, decreasing or is in thermal stasis. All the statistical debate is thus simply rhetoric of a quasi theological nature where the debaters are arguing over beliefs. As Trenberth famously put it, there must be something wrong with the data, missing heat and all that. The non scientific mind seeing only what it believes. And remember that the computed temperature trends are all within +/- 0.5 degrees Celsius – or varying in the white space between the temperature calibration marks on a standard meteorological thermometer. I agree with you regarding a “temperature of the earth” but that doesn’t mean you can’t attempt to model the mechanics of what is going on. In David’s case he isn’t saying “here’s my model and hypothesis-the sky is falling in.”(even if he did say the water vapour emission layer lowered a little, as measured, now explained). The hypotheticals of “force X” allude to the distinct probability of some other players which David is trying to nail down. I am intrigued by the plausible reasoning and the possibilities of further exploring the physical properties of rarified atmosphere subjected to varying conditions of magnetics and EM/cosmic radiation and it’s effects on the enormous systems that manifest our climate. It can boggle the brain but the clear and salient point I take from the series to now is: CO2 should not be the focus of world wide political attention as it currently is. Finding a novel verifiable cause for possible observed variations in climate is a meritorious scientific endeavour and I welcome David’s open and humble approach. I feel confident that on this path of logic some revealing discoveries will be teased out. I thank David and Jo for their efforts. ‘In that the coupled circulation of the stratosphere and the troposphere over Antarctica changes surface pressure at 60-70° south it changes the strength of the westerly winds in the southern hemisphere, cloud cover and surface temperature on all time scales. Stratospheric ozone is wasted above and below the stratosphere, processes referred to as ‘unknown dynamical influences’ in the more respectable polar ozone studies. ‘These phenomena are the very essence of the Southern Annular Mode, arguably the fundamental mode of global climate variation on all time scales. A thankless and never ending task but scientifically doomed to failure. One could be excused for thinking Fly has already reached a conclusion and will not easily be shifted by evidence. And, of course, all of the predictions, of the dire effects of Global Warming, over the last ten years, have come to pass? Including the rise of sea levels by 20 feet, and all of the Pacific Corals being killed by bleaching, and children not knowing what snow is, … and so on and so forth, ad tedium. Yes.. you are.. Story of your life. But do try to get used to it, dearie. So sillyfilly, what caused all the historical warming events then? Not what is causing the bulk of current warming! Over the last century natural variations are being dwarfed by the forcing of anthropogenic GHG emissions albeit ameliorated by the negative forcing of atmospheric aerosols. No Silly, we showed that the basic climate model, upon which the CO2 theory is based, is fundamentally flawed. The physicists got it right, but the climate scientists got it wrong. Fixing the climate model and applying modern climate data (admittedly unavailable in 1896 when the simplistic basic climate model was put together) shows that they have overestimated the potency of CO2 by a factor of 5 to 10. So, the modern warming is not due to increasing CO2 after all. Yes, the forcing of increasing CO2 may be correct, but the CO2-specific feedbacks (such as the rerouting feedback), were omitted. Oops. The WVEL is not rising and there is no hotspot. Oops. Current climate models fail big time. I do appreciate all your works. All your very hard work. I really do. However, I have come to the conclusion that CO2 does not warm the surface at all, but rather, the net effect of CO2 is very slight cooling in the lower atmosphere and much greater cooling in the upper atmosphere. The “big dog” on this planet is water in all its phases. CO2 is only a flea on the tail of the big dog water. After viewing you and Jo on the home video: you have mentioned both a tropical and a troposphere “hot spot”, which of the two are you referencing here? There is only hotspot. It is tropical and in the upper troposphere. See figures 2 and 3 of post 18 for what the hotspot looks like. Dr Alley showed climate switch abruptly from its cold to its warm state in just one year as shown in the Greenland Ice Core, GISP2 No Human intervention needed. …..The ice that had formed from falling snow during the transition from the last of the cold, dry, windy ice ages to the first of the warm, wet calms of the modern 10,000-year-long Holocene climate is 1,678 meters, just over a mile, down the GISP2 core….. This is also reported in “Abrupt Climate Change – Inevitable Surprises”, Committee on Abrupt Climate Change, National Research Council of the National Academy of Sciences ( 2002 ) Dr. Richard B. Alley chair. In 1999 Alley was invited to testify about climate change by Vice President Al Gore. In 2002, the NAS (alley chair) published The above book. So way back in 1999 Al Gore and the rest of the ClimAstrologists were well aware that the climate can switch from glacial cold to interstatial warm ” with startling speed” WITHOUT human SUVs! 0.8C in a CENTURY looks like a tempest in a teapot by comparison to the type of warming nature is capable of all by her lonesome. What about a reduction in cloud cover due to governments mandating that micro-particle emissions should be reduced (for probably the first time in human history) or governments making bottled gas available as a replacement for the burning of wood and dung? I believe the former occurred in developed countries in the 1980s and the latter about the same time or a little later in much of Asia. Silly-filly, wouldn’t you agree that this is a manmade change? David E, wouldn’t you agree that a reduction of micro-particles could cause cloud reduction? The Intergovernmental Panel on Climate Change (IPCC) was established by the United Nations Environmental Programme (UNEP) and the World Meteorological Organization (WMO) in 1988 to assess the scientific, technical and socio-economic information relevant for the understanding of human induced climate change, its potential impacts and options for mitigation and adaptation. The role of the IPCC is to assess on a comprehensive, objective, open and transparent basis the scientific, technical and socio-economic information relevant to understanding the scientific basis of risk of human-induced climate change, its potential impacts and options for adaptation and mitigation. IPCC reports should be neutral with respect to policy, although they may need to deal objectively with scientific, technical and socio-economic factors relevant to the application of particular policies. So there it is again. ONLY “human-induced climate change” is of interest and that is why you see very little work done on natural climate change. Worse it is the custom and practice of the IPCC for all of its Reports to be amended to agree with the political summaries. The facts are as follows. This was done and has been the normal IPCC procedure since then. AND HIDDEN AWAY SO NO ONE SEES THEY TELL THE TRUTH. They have no friggin idea of what the climate is going to do. But paradoxically they still claim that we can dial up a desired temperature by controlling CO2 levels. This is cognitive dissonance so extreme as to be crazy…. OR POLITICS! So it never was about understanding the climate. It was really about ‘options for mitigation and adaptation‘ and this is the change wanted by the Globalists like the UN, the World Bank, and the WTO. I think he was onto something. Even if today it might be a thermo nuclear plasma ball featuring two large dynamos. That’s 2500 years of knowledge. Are you sure that that thing is true? Or did someone just tell it to you? Now to hack Muzak and pipe it throughout every lift in Paris. For the music at the Paris-ite gabfest. I would like Songs from 1947 by Arthur Roberts If you have never heard these songs you are in for a treat. You can keep your damn ten billion volts, my soul will not be sold. Take away your army generals; their kiss is death, I’m sure. Everything I build is mine, and every volt I make is pure. Oh, beware this epidemic Berkelitis, I beseech. Oh, dammit! Engineering isn’t physics, is that plain? The link has both the words and the audio recordings. The Cyclotronist’s Nightmare (or Eighty Millicuries by Half-Past Nine) is my favorite. Lead Vocals: Everett W. Hall, Head of the Philosophy Department. Just like today,the extent of his observations were hamstrung by lack of reliable data. I have already posted this on the unthreaded page, while off topic I believe it may be of interest to many and as there are now two new post it might be missed, Jo or moderators please remove if you feel it does not belong. Over recent weeks I have been going through my VHS tapes while I still have a functioning Player, then digitising my collection of purchased tapes as well as some programs I’ve recorded myself. This morning I came across a Beyond 2000 special, “Climate in Crises” that aired in 1989, 26 years ago. Below are a few notes I jotted down. I have uploaded the video to youtube here. If interested watch it now just in case somebody has it pulled because of copyright. “ At the eight minute mark our host states, as the greenhouse heats the planet, the oceans will warm and as they warm they will expand, it means that in maybe just 40 years time the see level will be (spreading her arms) about this much higher. That’s about a meter than it is today, now it might not seem like much but it will cause tens of millions of people in Bangladesh in Egypt and in other low lying countries to lose their homes and their farmland, it will mean that some countries will disappear entirely”. We are now twenty six years into that forty year time span, by now if her prediction had any legs we should already seen a rise of seventy five centimeters. She then goes on to state Han Island in Papua is already being inundated by rising seas, then contradicts herself by explaining that Han’s inundation is caused by changing currents and not climate change, hoping that the vision of affected shore line will carry more wait than her true statement of the cause. About seventeen and a half minutes or so in our old friend David Attenborough speaks of the possible loss of Kirtland’s Warbler due to the probable loss of the Jack Pine forest in Michigan, all this was supposed to happened already, “the models said so”. A quick google search finds that the warbler is making a comeback and the State Forestry runs guided Kirtland’s Warbler tours . So much for that doom and gloom story. At about the thirty minute mark they actually admit that CO2 acts as a plant fertiliser, but claim it is the major green house gas, did no one tell them of the greenhouse properties of water vapor. Later they admit renewable energy can’t compete, not because it is expensive but because fossil energy is unrealistically low. In closing remarks they say “The United Nations believes we have just ten years left to stop the planet from spiralling into a catastrophic green house effect, just ten years left to put the greenhouse solutions into action” We are now sixteen years past the U.N.’s deadline and all seems well to me. It’s interesting to watch now with the benefit of hindsight. Was able to watch a minute of each: Bob Hawke, The lady at 8 minutes stretching her arms to show depth and David with his very eloquent tones. Keith, I came across this between 8 and 9 this morning. Have since spent most of the day editing out the adds rendering it and then re-rendering to a size up-loadable to youtube, in all, I must have watched it three or more times, I’m watched out, but just for the retrospective it was worth it. By the way at both the beginning and the end AMP were the proud presenters. Coincident or not, who knows. BTW, in 1989 I probably believed it all. Set aside June 6th for the most compelling special of our time. - You’ve heard in the greenhouse effect in newspapers and on television..
- but you won’t know all the facts unless you hear it from the experts ! - (PM Bob Hawke speaks) Beyond 2000, Channel 7 and the BBC present a television event that is essential viewing for all Australians. - You can contribute in a live phone-in as the program goes to air ! - One and a half hours of riveting television, that may well change the way you live ! Something strange went on in June 1989, as you say, in the promo they mention, “One and a half hours of riveting television, that may well change the way you live”! When I found and watched the program it went for 58 minutes with adds, 44 minutes + after removing the adds. Wonder if the the extra time was taken up with the call in. I taped it on NBN Newcastle, not ATN7, it may have been played at a later date with out the extras. Bob in your Youtube upload settings for this video is there an option to allow closed caption subtitles ? If there is please switch it on. A transcript would be very useful, but I can’t grab it through youtube cos closed caption option does not appear in the menu. Stew, pardon my ignorance, are you offering to add subtitles if I turn on the option, or just inquiring as to whether subtitles are already embedded in the video but not turned on? I checked up about Han Island it’s part of the Carterets atoll where the islands are sinking, so local sea level does rise. There’s more info about the June 1989 prog in the new BBC archive database. Thanks to StewGreen for alerting me to this new thread, as my test of the sea level prediction was back on the weekend page. Also thanks to Bob for reminding me just how awesome the Beyond 2000 theme music is. I was surprised to find a couple of good cover versions floating around on the net. A few hours after you upload a video to you tube it normally installs automatically to the video and creates a dodgy transcription from them. However this hasnt happned here.. so I wondered if it was something in the settings you set..Have a look at your end. It is likely that albedo regulates the Ice Ages and Interglacials too. Every Interglacial and pseudo-Interglacial warming occurred during a precessional Great Summer season** in the Northern Hemisphere. We therefore know that the NH precessional Great Summer season (measured at 65ºN on this graph) is a critical aspect in the modulation of Interglacial warming periods. So just as the normal increased annual summer insolation in Canada melts the annual winter snows, to produce a NH summer, so the precessional Great Summer increased insolation in the NH melts the northern Ice Age glaciers to produce an Interglacial. a. A precessional Great Summer providing up to 80 wm2 extra regional insolation. b. Dangerously low CO2 levels, causing widespread plant die-back. c. Many barren lands produced, promoting worldwide dust storms. d. Dust fallout darkening the ice sheets (dust always precedes Interglacials). e. Dust albedo providing up to 190 wm2 extra regional absorption. From this we can deduce that CO2 plays little or no role in the feedbacks that modulate Ice Ages. It is not global forcing-feedbacks that are important here, but regional insolation and regional albedo feedbacks in the NH that count. Graph of precessional Milankovitch Cycle insolation variation. Each blue sine wave is a 21,700-year precessional Great Year. The crests mark the 5,400-year Great Summer season in the NH. First of all, forget about those alleged 0.8 degrees of ‘global warming’ since 1900. Why? 1) The global temperature record has been adjusted there, the slope of the curve – as is much of the curve itself – pre ~1970 is all made up, a result of pure fabrication. As is the slope of the curve post ~1994. 2) Even the IPCC admits that prior to about 1950, one cannot and does not expect to find a CO2 signal in the global temperature record. Moreover, from ~1950 to 1976 there is no ‘global warming’ to be observed even in the official datasets. So the only ‘global warming’ period to actually worry about concerning AGW is the so-called ‘Modern Era of Global Warming’ starting, not approximately, but exactly at the time when first we had the ‘Great Pacific Climate Shift’, when suddenly the SOI mean level fell and the PDO (PDV/IPO, really) shifted abruptly from negative to positive phase, and then, just a few months later (not a coincidence! ), the AMO switched from the cooling to the warming mode of its cycle. It all happened in 1976/77. And so, second of all, global warming since this date is easily explained simply by ocean/atmosphere dynamics, essentially by the state of the ENSO process. The state of the ENSO process controls how much (relevant) solar input the Earth system will absorb, while at the same time controlling how much of this heat the Earth system will store vs. give up. Over a certain period of time. This will produce either a relative heat balance, or a positive or negative imbalance. From year to year. And from decade to decade. The Sun provides the heat, like you said, at more or less a constant pace. The ocean (and, to a lesser extent, the atmosphere), however, is what handles and distributes the heat. The key here, then, is the ocean/atmosphere dynamics, which are far from invariant over time, rather the opposite. The key is not the Sun itself. On secular and millenial time scales, yes. But not on (multi)decadal ones. This is all very obvious from the freely available observational data from the Earth system itself. There simply is no ‘mystery’ to be solved here, David. As I see it the observations of ocean oscillations explain heat distribution and can support either the “bounded random walk” hypothesis or some causal hypothesis. David’s calculations show mathematically that a causal hypothesis can’t be ruled out (it doesn’t specifically rule out the bounded random walk), and David shows that the 22 or 11 year frequency is at least consistent with a potentially causal signal. It is, in my view, a persuasive argument suggesting where to look. There may well be other minor signals, or there maybe random noise. Data is the key. So what drives the ocean oscillations? What drives ENSO? ENSO is a good predictor of global temperature on shorter time scales (less than a decade) — ENSO leads global temperature by 6 months. 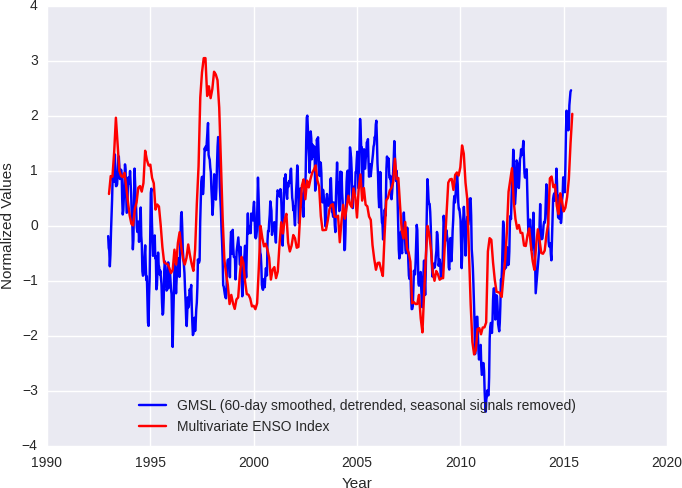 My solar model predicts ENSO well because it predicts global temperature well, as does any cumulative-TSI model. But I’ll let others (like Tallbloke) deal with the prime movers. Good read Andrew and reading through the comments I found this, ENSO controls sea level. I’m not saying the Sun isn’t what ultimately pulls the strings here. All I’m saying is that the only thing you need to explain ‘global warming’ between 1970 and now is ocean/atmosphere dynamics focused on the particular state (or phase) of the various processes governing the climate regime of the Pacific Ocean and how these teleconnect to other parts of the world, notably the North Atlantic and the Indian Ocean. The ENSO process is The executor of all this, simply from administering the far and away biggest storage of energy on our globe, the West Pacific Warm Pool (WPWP). ENSO maybe the key, fascinating stuff. So in turn, what makes the Pacific Warm Pool warm? Is there a feature like anomalous geothermal gradient below it? (I do not think so, but some mechanism is called for). What’s happened in the last 50 years or so when TSI and Temperature data do not display statistical correlation? We’ll get to that in posts soon. Btw, non-correlation does not rule out causation. I have not done the research on ozone’s effect on the trade winds. As you point out, it is water in all its forms and phases that is the main climate driver on water world earth and the temperature data sets are all fraudulent fiction that makes finding out the real scientific causes that much more difficult. Thanks for the links, I hope some here read them. I have, and they make a very good case. Note two things that influence the current AGW. 1) In the U.S., the “Silent Generation”, who were scared little kids during WW II, need to “Save the World” as they saw others do as they live their 4-year old fears of lack of food, doctors, parents dying, nukes, etc and were the “teachers and guiders” of the Gen-X folk (1960-1980). 2) engines work on magnetic coupling. The Earth moves relative to the sun from a perihelion of 147095000 km to an aphelion of 152100000 km. This corresponds to a perihelion sphere of 2.718977947×10¹⁷ km2 in area, and an aphelion sphere of 2.9071557×10¹⁷ km2 in area. As such the decrease in received heat from the sun is 2.718977947×10¹⁷ / 2.9071557×10¹⁷ -> 6.47%. Further the more minor variations of all the various physical aspects of the movement of the Earth cause more long term cycles. Then there is its movement through the galaxy and the local intergalactic area. There is no global warming, only urban heat islands and some natural global cooling. Please note, as the evidence and hypotheses are presented in this series, that the precise reconstruction makes no difference — because the notch-delay hypothesis is mainly about shorter term cycles, nearer the higher 11-year frequency. Only in the predictions post does the background reconstruction make a difference, and there we have made predictions for each of the two main reconstructions. 2. When we consider mechanisms, cosmic rays and cloud seeding are considered along with several others. They are almost certainly part of the answer, but not the whole answer. Running with Svensmark on nucleation in spite of the CERN evidence to the contrary? Best of Luck! The CERN findings to date have not revealed a mechanism for nucleation because experiments have produced particles that are too small. OTOH the experiments have not closed the door on nucleation. There are more combinations to be examined in more experiments. The main papers on this CERN work are quite impressive and of high quality, which makes quite a change from the usual climate-related drivel. Poor sillyfilly. You know you’re having a bad science day when you get schooled by a dead guy. You can certainly be forgiven for not knowing what the CERN CLOUD results meant for climate change because the Director-General of CERN told the scientists “not to interpret them”. You see, Climate Science is similar to Science except you skip over the 5th step. It’s just lucky that Neff showed in 2001 the results of a 3000 year experiment already done by the earth [doi:10.1038/35077048] that established the cosmic-ray effect on climate long before the CERN CLOUD experiment was even conceived. Jasper Kirkby was only reproducing in the lab what had been inferred from proxy data 10 years earlier, and had been proven from AERONET data a year earlier by Bondo and Svensmark. Once again the horse has bolted halfway around the world before the fact has got its boots on. Few climate scientists were trained in them — they have probably never heard of most of them. You’ve just made a very serious indictment of the climate science world. And indirectly, a good complement to those of us who spent our time and effort to make things work — usually, work or else… So thank you. Those analysis tools are used by more than the electronics industry. Even mechanical engineers may need Fourier analysis to figure out what’s going on. And here’s the kicker, Fourier was working in the social sciences so I’m left wondering why the Lewandowskis of this world never tumbled to the idea of looking for periodic behavior and using a tool one of their own made available in 1822. It’s been there for a very long time just waiting for the right guy to come along and apply it to the global warming phenomenon. And hello David Evans! You need to get rid of that picture of the sun low on the horizon and glaring right in the camera lense. It reminds me too much of driving straight east into the rising sun and then again straight west into the setting sun. I’ve never been so happy to be rid of something in my life as to be rid of that daily drive while blinded by sun. The etymology you presented, although interesting, is most likely incorrect. The word Amen when used in prayer is always used as a response to a blessing. The loose translation of that word from the Original Hebrew is ‘so be it’. The root of that word is the Original Hebrew word for ‘faith’, emunah, and the in the Original Hebrew language the word ‘faith’ is equvalent to the word ‘confidence’ because the concept of ‘blind-faith’ doesn’t exist in Original Hebrew. So for example in Parliament, a vote of no-confidence is called ‘ee-emun’ (ee as in ‘see’,) in Hebrew. Then by all means you may have my share as well as yours. When doing mineral exploration around old gold towns in WA we did discuss if we should concentrate on areas east of the towns because of earlier people avoiding the sun in the eyes by looking in places to the west. It could have arisen from living in Perth, where many a days drive finished with that sun in the eyes before sunset. I am in the Sunny South (mid North Carolina) where we get snow maybe once every five years. We have only a few influences on the planet that are truly global: the Haber process which fixes as much nitrogen as the biosphere; light oil and surfactant spill which smooth the ocean surface; halocarbons; dissolved silica run-off from agriculture. Perhaps you can think of a few more. So… Oil and surfactant reduce wave breaking = fewer salt aerosols; less mixing = lower nutrient levels = lower levels of DMS-producing phytoplankton; more dissolved silica = more diatoms = outcompeted calciferous phytos = fewer DMS particles; more nitrogen disrupts phytoplankton populations, who know what this does to DMS; smoothed surface has lower albedo…. Remember Wigley’s ‘why the blip’? Well, if you spend a war sinking tankers then you are certainly going to have an effect on the sea surface. A few years ago we flew to Madeira and from abeam Portugal for 40 -45 minutes we flew over a smoothed area, hundreds of miles long by more than a hundred miles across which had suppressed wave breaking in winds that, to judge by the waves in the unsmoothed areas, was about Force 4. I used to fly maritime Buccaneers and spent a lot of my time flying close to the sea surface. The pollution is appalling, thousands of square miles of smoothed surface. Not oil-slicked, smoothed. Google ‘Benjamin Franklin Clapham pond’ to see the process. When The Gulf rig blew I ran this past Judith Curry who tried to get an aircraft over it to see if it really was affecting aerosol numbers. No luck, a/c booked. I believe I can see the effect on the NASA images, but that might be the fond eye of fatherhood. There was a recent study which looked at the ocean surface, Whoever did that could find out what the hell that Madeira smooth actually was made of — not the Med because that flows in, maybe the gyre but in that case what was the agent? Anyway, you asked what was causing the warming. There you go. Disrupted oceanic aerosol production. If you get a Nobel I want an invitation. Thanks Julian. We discuss mechanisms in a future post. Organic aerosols are right up there as a possibility. Man-made pollution isn’t gong to correlate with solar activity so this presumably won’t show up in the investigation here? Interestingly enough, if dissolved silica really is increasing the length of time that diatoms dominate in the spring, their C4-like carbon-fixing metabolism would pull down a proportionately smaller fraction of C12, leaving an enhanced C12 signal. There are calciferous plankton species which turn to C4 when they are short of various nutrients, so reduced mixing would/might/may also be sending a false C isotope signal. Remember the ‘it must be CO2 because we can’t think of anything else’? They should have asked the SF community to whom such speculations are meat and drink. WASHINGTON (AP) — When it comes to climate science, two of the three Democratic presidential candidates are A students, while most of the Republican contenders are flunking, according to a panel of scientists who reviewed candidates’ comments. Ted Cruz of Texas had the lowest score, an average of 6. All eight put Cruz at the bottom of the class. EDITOR’S NOTE This story, assessing political claims that take shortcuts with the facts or don’t tell the full story, is part of an occasional series focusing on the science, the costs and the challenges of climate change around the world ahead of a summit in Paris. Pat, I’ve heard Ted Cruz on climate change briefly, and I have to say I was in agreement with what I heard. Maybe Cruz and others need to find out what has been happening on this website. We all need to put the summary onto Facebook, Twitter and our local members. It needs to be widely spread so that there is pressure on the Warmist Scientists are forced to review and reply. Without full on publicity it will be ignored. I have already written to our local member suggesting he ensures his colleagues study it before Paris, so they don’t get egg on their face! Ted Cruz appears to be the most knowledgeable about the state of climate than all the other candidates. So Seth Borenstein has it all about face. As do those 8 feeding him tripe. UN climate talks could start a day earlier than planned, after officials charing(sic) negotiations suggested the 195 countries taking part should meet on Sunday 29 November at 5pm. The I.P.C.C.cannot suggest the influence of the sun has an action on our climate. It would be too hard to convince people that they must have unaffordable electricity to finance the invention of knobs that will dim or brighten the sun. Of course trillions of dollars of poor money will be required to do this. But you can be sure there will be believers. What a shame we cant throw a blanket over it and test the theory? On the other hand I think the fairly regular temperature drops during night hours might be a clue. While Europe portrays itself — and will again in Paris — as the global leader in reducing GHG emissions, the only reason it can make that claim is through smoke and mirrors. That’s because Europe crafted the 1997 Kyoto accord — which expired in 2012 — to recognize 1990 as the base year for reducing GHG emissions. By using 1990, a year before the Soviet Union disintegrated and its industrial GHG emissions dramatically dropped because its economy collapsed, Europe was able to claim much of this emissions drop for itself, as major parts of the former Soviet empire were absorbed by European countries. That’s why, if Trudeau was to implement Canada’s current GHG reduction plan that has been submitted to the UN, he’d have to shut down the equivalent of 58% of Canada’s oil and gas sector by 2020 and 100% by 2030. Which is a good illustration of the ***fantasy world the UN lives in when it comes to climate change. The EU and especially Russia certainly played the Kyoto Protocol to perfection by settling on 1990 as the baseline year. But Australia also came up with a great fiddle too by actually getting the Kyoto Protocol members to agree to this country increasing its net emissions to 108% of 1990 emissions in the final ‘commitment period’. And to top it all off Australia then proceeded to make this target easy to reach by getting Queensland and NSW to effectively ban broad-scale clearing of trees in both States. Voila! Urban yuppies could continue to burn fossil fuels to their heart’s content and we would still achieve our very generous Kyoto (granted emission increase!!) targets. Of course the nations of the world have now wised up to the European and Australian fiddles incorporated into the Kyoto Protocol. But in anticipation both Labor through its CFI and the Coalition through its Direct Action have again been drawn to the Land Use Change and Forestry sector in search of an easy out, should a ‘Paris Protocol’, aimed at further reducing CO2 emissions, emerge from COP21. So both Government and Opposition have done their best to enshrine “avoided deforestation” as the saviour to avoid/minimise really hard to achieve fossil fuel reductions (which would lead to the Politicians identified with such action losing office at any ensuing election). All countries with large areas of forest and woodland love “avoided deforestation” as a means of reducing GHG emissions. Because all it requires is a person’s word that they fully intended to clear the woody plants from their landscape (whether that assertion was true or not)- and in Australia’s case the Government will then reward you with payment following an Auction of Carbon Abatement Contracts if you simply promise not to clear. When you want a soft touch you no longer need find the gullible to sell any well known bridge to. Nope that could also land you in gaol. It would be much easier to sell Carbon Abatement Contracts to the Australian Government and you would be paid good money for effectively doing nothing on your landholding. In effect our Government is paying out hundreds of millions of dollars of taxpayers’ money to landholders for the air that the trees on their holding are ‘breathing’. It must make the “cargo cult” people of the New Guinea Highlands green with envy. [Hang on – they have been onto this scam even earlier than Australia!]. [Disclaimer: This comment is about the politics of GHG emissions deception. It does not necessarily reflect my personal position about the utility of reducing CO2 emissions]. Bill, as someone involved with Australia’s carbon accounting, I’d have to say that comment is on the money. Science News / New Science 20: It’s not CO2, so what Is the main cause of Global Warming? ‘Solar influence on the intensity of the Indian monsoon is demonstrated using a sediment core from the eastern Arabian Sea dating back to 1200 yr, through pattern matching as well as spectral analysis of proxy records of monsoon and solar activity. The intensity of the Indian monsoon is found to have decreased during periods of solar minima during the last millennium. Periodicities of 200±20, 105±15 and 60±10 yr are observed in the proxy records coinciding with those known for solar cycles. Solid thinking JoNova and David. Sadly, even with a solid hypothesis, the grand minimum throws a curve so that you are now seeking the missing elements. Good suggestions may or may not pan out in the short term, but it is definitely not a reason to throw away any possibilities. I’ve been very interested in induction heating. A process that is similar to the interaction of Earth’s metallic core, magnetic fields and the sun’s magnetic fields. Just slowing the cooling of the Earth would be a major contribution to the Earth’s biosphere. Any influence on atmospheric temperatures must be delayed from periods of high energy magnetic fields. Then there is the upper atmosphere where the magnetic fields interact the strongest. Another aspect of solar radiation is that all solar radiation are frequencies. When I heat cocoa, the real deal not premixed stuff, in water or milk I find myself fascinated with how the microwave frequencies settle out the cocoa quickly. Particles that stay mixed for hours normally separate out, sinking to the bottom on a visual timeframe. Consider that clouds generally require dust seeds for water condensation/crystallization. What if certain solar frequencies, e.g. 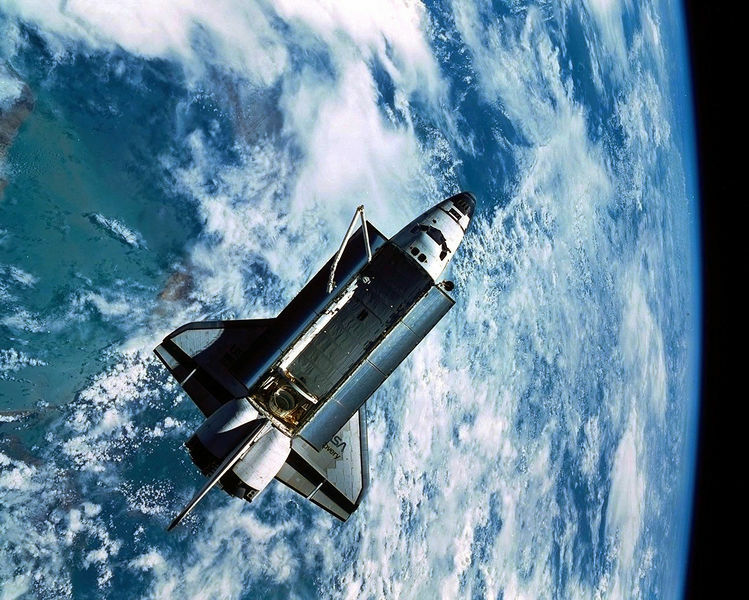 microwave and radio, settle dust out of the atmosphere quicker? Since many of the upper air dust particles are meteoroid fragments, ash and space particles a combination of low solar wind and dust settling frequencies could greatly reduce upper atmosphere cloud formation. Water is a dihydrogen oxide HOH flexible molecule. IR absorption is just one of it’s atomic abilities. Other frequency absorption bands could keep water molecules from condensing, particularly if the water is also reacting to magnetic field strengths, (vibrating) and is similarly settled out of the atmosphere much as a dust particle is by certain frequency bands. Small things certainly; but small things add up quickly. Atheok, That is certainly part of what controls our temperature. Keep up the good work. It is certainly true that notch filters can have (generally do have) delay. All mine did. In a follow-up this September, I expanded the idea and added related examples of cases where a ring-like array of zeros, with one pair “punched out” can look like a pair of poles and sharpen a null. (Fig. 11 and Fig. 12 there) A possible advantage of using only delays and sums is that both are easy mechanisms in nature (i.e., constructive and destructive interference). For whatever it might be worth! The sole reason for favoring a bi-quadratic transfer function is that it arises from a relatively simple (2nd order) linear differential equation (LDE). It is the simplest way of getting a notch from an LDE. LDEs arise naturally all over the place so they are a first thing to try, but they are not the only possibility, so yes, a filter constructed out of multiple delays may be what is happening. (1) If we had a simple delay/sum comb filter with delay T, the first null would be at 1/2T. In my case of spreading the delay/sum, washing out the periodic nulls, the one that remains is still roughly at 1/2T. For example, if the notch is at 1/(11-years), T=5.5 years, not that far from what you thought (7 years ?). If the null and the delay do not agree, then my guess is wrong. Something to keep in mind? (2) The bi-quadratic is not similarly constrained to 1/2T. So that is better. True, 2nd-order DEs are common. But, to me, in filtering, this means a resonance or something very much like that is postulated. This is (relatively) a much more complicated physical mechanism than a delay/add. (3) Third Point: What does the “delay” mean here? I think we mean group delay (d phase / d omega), which is not constant unless we have a linear phase, which is a common FIR filter, but means no poles. And what does it mean to delay a signal that is being nulled out? I have to think about this. On a hopefully related note… I was reading about damped driven harmonic oscillators the other day. One question I had which I cannot figure out the answer to is this: is it possible for a driven damped harmonic oscillator to exhibit a frequency which is lower than the frequency of the driver? I was wondering if the so-called 60-year oscillation in recent climate change could be modelled (in black box way) as damped SHM which never reaches steady state, particularly as there is some evidence that the 60-year period in the last 150 years is not a fixed period but a recent quirk of circumstance and the oscillations were higher frequency in the previous century. 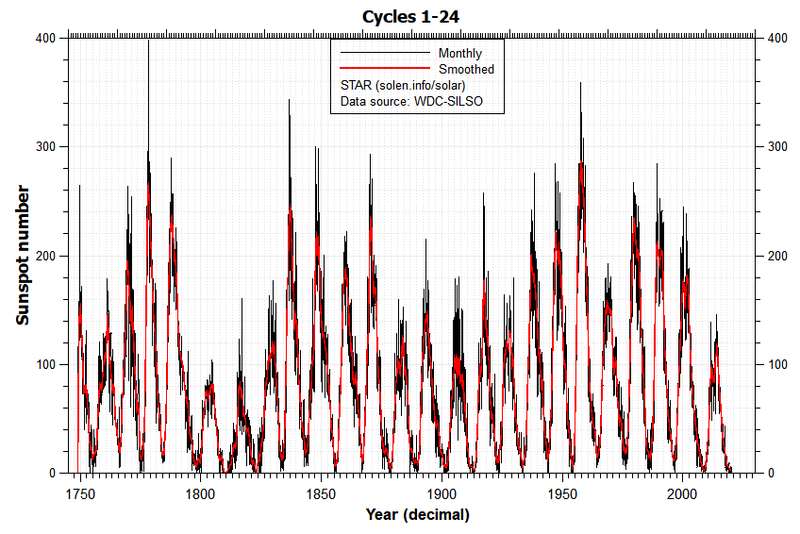 I wondered if the solar cycle could be the driver and the longer term (3:1 ??) oscillations were the damped resonant output, but that requires the damped frequency to be lower than the driver, which may not be possible in this equation. What do you reckon? Short answer – no it’s not possible. The mass/spring/friction system you reference is (ideally of course) a linear system and when we say it is “driven” that implies an infinite duration sinusoidal waveform is applied. It is equivalent to an electrical resonator (often a band-pass filter). The same frequency that is applied appears at the output (phase and amplitudes changed in general). Now, if we assume instead a “driver” such as a narrow pulse (impulse – non sinusoidal), it will produce a damped oscillation (sinusoidal with amplitude decaying exponentially to zero) and may well looks locally (cycle to cycle) like the natural frequency of the resonator. But, in this case, the impulse contains “all frequencies” so it is meaningless to describe any output frequency relative to a (non-existing) input frequency. I suspect that your notion of a sub-harmonic was the result of seeing descriptions of NON-linear (and often chaotic) resonators. They can produce sub-harmonics. They do about what they want! Proverbial can of worms. Andrew, I don’t know if this is of any use, John Ried has a piece on frequency downshifting in a wave tank. . I hope the link works this time, if not it's on John Reid's blog called Blackjay and look for page about waves. Very nice! Combine that with a possible transport delay of orbital/rotational (physical) effect from the angular momentum of the outer two gas giants. Is momentum ‘conserved’ at c, greater than c, or much less than c? Is momentum even conserved on a whole solar system? Why? One of the gas giants can be considered as a failed sun, the recycling effect of the charge field[the missing 80% of our universe] has a profound effect on the Earth and can explain some of the Earths cyclic climatic behaviour. My gut says Spectral Variability will be the cause. The IPCC thinks that all frequencies heat alike but science and engineering know that the heating effect on a particular target depends on the spectrum of the light and the emissivity of the target which varies according to frequency. So for example CO2 is COOLING the planet by making the red areas green so that green light is reflected instead of red. Green light being higher energy that red light. Hue will dictate the weather not brightness. I also think atmospheric ionisation will have an effect as a more active solar wind and higher UV will cause a thicker ionisation band around the earth. The electric effects are bound to influence weather. Solar driven ocean heat transport. Spectral Variability (ozone and NOx) AND Solar driven ocean heat transport. You are looking at more than one effect of the variation of the sun. Thanks for all your work on this topic. The maths has left me for dead. It’s 50 years since I did that stuff. You may have answered this question elsewhere. How much of the so called warming is due to the UHI effect, and adjustments of temperatures in rural areas to simulate warming? When there is no signal of warming in SE rural Australia, and none in the corn belt of the USA, it seems to me that UHI maybe a very large factor in the average global temperature increasing. When you look ar Roy Spencer’s satellite record, there appears to be very little warming before the Super ElNino, and no warming after that ElNino. Ian, all good questions but I have no answers. I’m just looking at global temperatures as modeled or theoretically predictable, not as “observed”. Yes, the methods of observing leave a lot to be desired. The fact that the warming is step-like rather than echoing the steady rise in CO2 is of course very suggestive. Hard to overlook really. I reckon the warmists overlook it, like all the discordant evidence, because they believe in “the basic physics”. Which is why it is so significant to them (though not to skeptics) that the application of the basic physics to climate has been discovered to be wrong — fixing the architecture reduces predicted warming by at least 80%. The physicists got it right. The climate scientists got it wrong. When this sinks in, the warmists will peel off the theory. It might take a while, but you can speed it up by pointing it out to them. This is getting way past the RIDICULOUS stage !! it would be more informative if people specified being on topic. ‘We find that 2 cycles of periods 200+ years and ~65 years determine practically completely the climate changes. All other cycles are weaker and non-periodic processes play no significant role. ‘The ~65 year cycle is the well-known, much studied, and well understood “Atlantic/Pacific oscillation” ( AMO/PDO ). It can be traced back for 1400 years. The AMO/PDO has no external forcing it is “intrinsic dynamics”, an “oscillator”. correlation with cycles derived from the data is not causation. 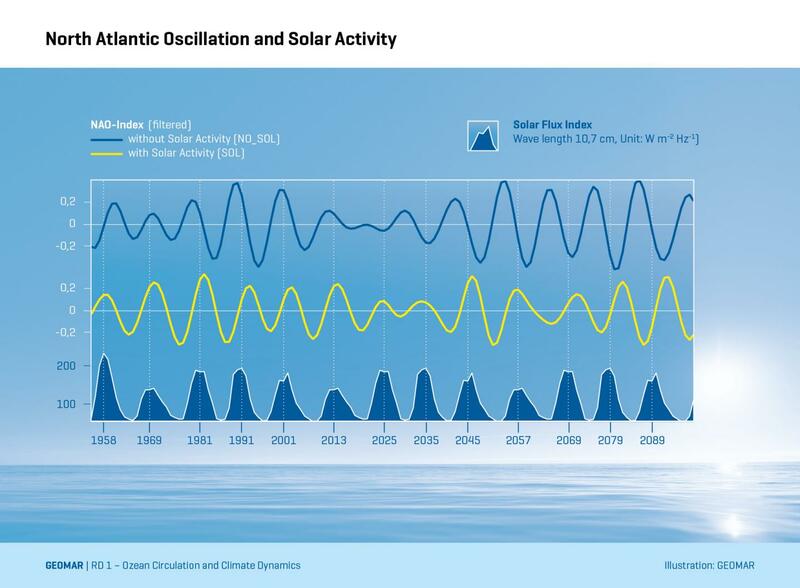 I thought we all agreed that the sun is the main driver, but here we have two oscillations which run under their own steam at regular periodicity. Some kind of internal dynamic. Just to get a grasp of where we are, imagine its 1962 again. And here is the AMO. A lot more convincing than sticking a straight line through data that clearly is not linear, to show good correlation with the Log of something that humans contribute bugger-all % to, use it to claim that we are 95% sure the world is warming due to human emissions and then threaten anyone who denies the science. The context is whether the data fits better a climate that is naturally oscillating or one that was constant until man’s emission started to grow exponentially. The AMO and PDO appear to be in sync unrelated to the sun, while the AO/NAO does seem to correlate with the behavior of Sol. So where did the heat come from at the end of the 20th century? Scafetta and Mazzarella have discovered a 4-5 year oscillation responsible for the increase and decrease of sea ice in Antarctic and Arctic waters. ‘Nicola Scafetta has published the most decisive indictment of GCM’s I’ve ever read in the Journal of Atmospheric and Solar-Terrestrial Physics. His analysis is purely phenomenological, but he claims that over half of the warming observed since 1975 can be tied to 20 and 60-year climate oscillations driven by the 12 and 30-year orbital periods of Jupiter and Saturn, through their gravitational influence on the Sun, which in turn modulates cosmic radiation. ‘If he’s correct, then all GCM’s are massively in error because they fail to show any of the observed oscillations. It’s a vicious admix of greed and incompetence! The discussion has been ongoing at Tallbloke’s over the last four years! The outer two giants, seem to have long moment arms, influencing the systems angular momentum throughout. That plus the the beats. Likely a very skilled musician is required for understanding. The magnetosphere of the gas giants has been overlooked, they maybe still born suns with a strong impact on our climate. What is the cause of the see-saw effect in polar regions? AH… the leaf-brain posts another empty post. Well done. you continue as a leaf with no substance. This was a very easily assimilated outline. Well put together and can now understand what the notch idea is about. One thing that stood out is that there will need to be a time frame set for any model put forward as the end model. In the outline here we are looking at a model with a time frame of 11 years and looking for a warming mechanism so far hidden from view; maybe a soalr variation of magnetic flux. This model contrast with the other known Milankovich type mechanisms where distance from a constant TSI Sun is the variable and the time frame is a period of 110,000 to 130,000 years. One concern is what some here refer to the Luke-warmer approach where CO2 is still being allocated a part in the “Global Warming” even though it is very unlikely to have any discernible affect. One thing that could be done here with ample justification is to quantify the Human Origin CO2 effect. It is conceded above that 20% of recent warming is due to CO2. This does not describe human attributable warming which is a miserable 4% or so of total CO2 output. Natural sourced CO2 (probably highly understated) is about 96% of the full CO2 effect. This means that human origin CO2 accounts for 0.6% of the full Warming Effect as outlined above. Isn’t this insignificant ?? We already know that CO2 does not have the impact on climate that is claimed. We do not need an additional papers or studies or anything else. We already have all the physical evidence we need to declare CAGW to be complete nonsense. IPCC wanted us to believe we would see up to 6 degrees warming from a doubling of atmospheric CO2. Well, we have already increased CO2 54% from pre-industrial levels and so far have seen 1 degree warming. Of that 6 degree claim were correct, we would have already experienced most of that warming by now. We haven’t. We need no other information than what we already have. Atmospheric CO2 has gone up and since the end of the Little Ice Age we have seen about 1 degree of warming. Subtract what is natural recovery from that event and what that leaves, whatever amount that is, is a rather tiny amount of warming attributed to CO2. So — we know turtle egges are not going to “fry” because if that were so, they already would have from increasing atmospheric CO2 by 54% from the pre-industrial era — and it STILL isn’t as warm today in Greenland as it was 1000 years go. Crosspath, the warmists believe in the danger of CO2 essentially because of the conventional basic model. It has fundamental flaws, which when fixed show CO2 has a fifth to a tenth as much effect as they thought. When they find this out, and accept it, their belief in the dangers of CO2 will wither. The lack of belief will be spread to the politicians and journalists, and the whole bureaucratic-academic complex. Yes, it will take a while. The AGW meme will not be defeated until the conventional basic model dies, because it is what fuels the certainty of the believers. Most skeptics arrived at their doubts in the carbon dioxide theory of global warming by noting the discrepancies between that theory and empirical evidence. They are empiricists. Consequently, many skeptics are unaware of the basic model, or its power, because it has been irrelevant to them. But establishment scientists are well aware of the basic climate model, and that it unambiguously points to carbon dioxide as the cause of recent global warming. If you believe the conventional basic model, there is indeed good reason for being alarmed about rising carbon dioxide levels. So the first part of this series, on the errors in the conventional model, may mean more to the leading lights of the establishment than to skeptics. I have long felt that glaciers make poor ‘coal mine canaries’ with respect to warming. They are complex systems where any one of several factors can cause them to retreat. Conversely, Those who try to explain the apparent growth of glaciers in Western Antarctica correctly point out that warming can cause increased snowfall. There is anecdotal evidence that albedo may be more important than global air temperatures. Classically, the zones of snow accumulation experience considerable cloudiness. In areas such as Glacier National Park and the Himalayas, glacial wasting appears to be greatest on slopes with south-facing aspects. Thus, presumed increases in air temperature are not having uniform impacts. If alpine glaciers have experienced decreased cloudiness, there should be a selective influence on melting and retreat. If soot or dust is falling on the snow surface, the melting should be exacerbated by exposure to the sun. Therefore, I think that you are on track to focus on albedo. As explained by Alex S. Gaddes in his work ‘Tomorrow’s Weather’ (1990) – the major cause of ‘warming/cooling’ is not direct TSI fluctuation – but ‘albedo’ fluctuation. That is, variations in volcanic and wind-blown dust, as well as ice and cloud. According to Rankama and Sahama, ( Geochemistry,Chicago Press (1950) – CO2 is self-regulating via the oceans’ ability to act as a ‘carbon sink’ once partial pressure is achieved in the atmosphere. ‘Albedo’ is increased by explosive Volcanic activity and wind-blown dust etc – but decreased by Solar induced ‘Dry’ Cycles, wherein Solar particles (X Factor?) diffuse upper atmosphere cloud. if the effect of increased ‘albedo’ is greater than the effect of Solar induced ‘Dry’ Cycles – we have an overall ‘cooling’ trend. Thus, increased volcanism, (2015 for example,) corresponds with an overall ‘cooling’, in spite of the ‘superficial’ warming of A ‘Dry’ Cycle onset. ENSO would seem to have little or nothing to do with it. So, this article claims David’s position is that we’ll see a cooling of about 0.3C between 2017 and 2021. David, what’s your best guess for the 2017-2021 anomaly average (1961-1990 baseline)? You can compare it to the null position of a continuation of the linear trend since 1975 – extrapolating that trend (0.173C/dec going by HadCRUT4) gives an anomaly average of ~+0.68C for the 2017 to 2021 period. Tristan, the predictions post comes after the theory. Soon. Meanwhile, I’ve stuck up the prediction summary on the project home page. I did a search on this page and nobody wrote something about the recent Zharkova paper in Nature. She produced à hindcast of sun magnetic activité, un thé part of her analyses. Si, it’s about finding a corrélation betwen this dataset and a climate signal such as cloud cover (when we have data) or température. Easy to say, hard to do ?? Apart from the warming as the earth emerges from the LIA—why could it not be the black carbon effect on albedo? Arctic ice and glaciers are covered in this black soot—the initial melt is amplified as more dark water absorbs yet more heat , causing further melting and it sets up what’s been described as a catastrophic global warming cycle. Nothing ever seems to be done about it—it’s there in every photograph we see of the ice. The burning of forests and peat in Indonesia and other parts of Asia continues unabated. We’re told mitigation of BC is easy relative to that of CO2—and has almost immediate effect—yet we see no clamoring for that to be done. My suspicious mind tells me that warmists are deliberately leaving Black Carbon unaddressed until they have the world rejigged and wealth redistribution under way under UN control—irreversible global governance changes made. They think mitigation of BC would show that CO2 is not the GW driver they want us to think it is—and the game would be up—CAGW alarm and the control it gives them gone. They’d have to find another way to mould the world to fit their world view. I am not a scientist, but I have a reasonable grounding in scientific technique. I also work in a field whereby critical evaluation of cause and effect is crucial. David’s thesis is the first reasonably sensible approach to the “global warming” question that I have seen. It starts from first principles with respect to the supply and dispatch of “heat” from the Earth and by remaining deliberately “global” and over longer time frames than seasonal, it does not fall into the trap of confusing the trees for the wood. To summarise my layman’s understanding of David’s thesis: it is the “strength” or “disappearance” of the Sun’s magnetic field that seems to be the major factor in the change the Earth’s albedo, and hence the global temperature. In this case, the albedo is being driven by cloud formation caused by charged particles that when the field is strong do not penetrate the atmosphere. Consequently a strong field repels particles which reduces cloud formation and increases temperature, and vice versa. (Sorry for the layman’s summary of all your hard work and intense maths!!). I was struck by the similarity to the fact that electricity grids “self synchronise” – in other words that when a generator is added to an electricity grid, it “adopts” the frequency of the grid. Is there a parallel here whereby the Earth’s magnetic field “responds” to the Sun’s much greater field and when the Sun’s field is weak, so becomes the Earth’s, thus increasing the albedo effect? As you say, it’s not CO2. See itsnotco2.wordpress.com to find out how the required thermal energy is supplied to a planet’s surface, because it is NOT by radiation, and so CO2 has nothing to do with it. I was also affected by the fear mongering of the media when I first heard about “Global Warming” till my father explained that the Earth and everything and everyone on it, runs through cycles. The Old Farmer’s Almanacs show that we had warming weather hundreds of years ago as well. We are insignificant when you look at how large the planet really is and we emit less than 5% of the CO2 emissions? So what is causing the warming? Well I think humans are not HELPING the matter but I don’t think they are causing the problem. Last year during the Summer I noticed while staying at a motel up in the mountains (no other lodging options unfortunately) the window AC units were all working their little hearts out to cool the inside but the heat that came off of them was remarkable. The walk past the rooms with them blowing was horrible combined with the heat of the weather for that season, it was stifling. The heat emitted as a result of our technology and progress, is affecting our immediate surroundings but I do not believe it is affecting the polar ice caps. That makes me think that the sun is starting to get hotter and I’m not sure there’s a lot we can do about that. Just my two cents. hmm… will this help with refining and developing the research reported in this post? Hang on, I’ll ask Fly. All sounds a bit like a spoilt kid in a Lolly shop.